Hello my lovelies! Could anyone tell me how the heck is already the End of November? Is THAT time of the year, again! It's the time to start the Advent calendars, ginger bread, baking cookies, lighting candles, decorating Christmas Trees, and shopping loooooaaads of presents. What else can you ask for? Sometimes there's so many things to bare in mind, so many details and so much to do, that you may want to simplify some of it. That's why I think the Christmas theme water decals that I received from Born pretty store for review are genius! How are you today? It's day 29 of the 33 Days Challenge, and today's prompt is my favourite pattern. I don't really have a favourite pattern for clothes but I do for nails! I love how leopard print looks on the nails so I went with it. Hello my lovelies! How are you doing? I already know how the game goes, because I own several long lasting eyeshadows. So I wouldn't say I'm in lack of cream-y eyeshadow. I'm so happy it's Friday I'm just going to skip the fact all my pictures for this post are so crappy and smile! This is day 27 of the 33 Days Challenge, we are approaching the end! The prompt for today was 3 pattern manicure, and as I like to complicate things (as usual) I wanted to recreate a mani from The Nail polish project, but using different colours. Hello my dears! how are you? Any nice plans for the weekend? Why don't you ever tell me?! too shy? no plans :( ? Today is day 25 of the Crumpet's Nail Tarts 33 Days Challenge and the prompt is "a new technique for you", that is for me, not for YOU. I always find the "pond" technique very cool so I decided to do a slight variation of it with flowers. Today I have some Born pretty store Elegant roses water decals to share with you and this mani is really cheering me up. I've already said how I like water decals as an easy nail art and that I also prefer them to stickers because they're so thin they're hardly noticeable. For those reasons I was quite impatient to test these flower decals. Hello my lovelies! How is your weekend so far? I hope you're enjoying it. My everyday makeup routine has changed and a bit since the last time I wrote about it, but for the past month I've been using the same items regularly, so I thought I'd write an update on the items that are currently in my makeup bag. I like to do it to keep track on what I wear and also because I'm quite curious about your feedback. Hello my dears, how are you today? 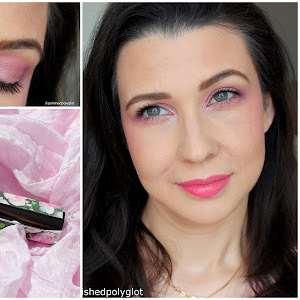 The 33 Days Challenge continues today with the prompt "the colour you own the most". I have my collection reunited in colour families (purple, blue, green) and then nuances (light blue, medium blue, navy blue, etc). So without hesitation I can say the colour I own the most is Green and the nuance of green that I have more off is Teal green. I always think of Teal as blue/green shade more towards the green side, as the bird, and turquoise more towards the blue, as the stone. Or is it the other way round? I guess this is totally personal and all the more subjective. Hello my lovelies! I have some exciting news to share with you, is the New Essence Trend Edition for Holidays! 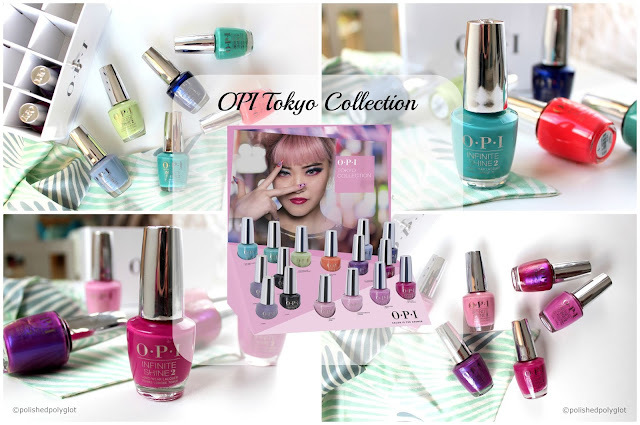 It's named "Happy Holidays" and it features several nail art related products, along with three eyeshadows blushes, lippies, false eyelashes and a hair accessory. You can see the whole collection here. I've spotted this one at Manor, but I'm pretty sure it is already available at Coop and Müller as well. I've only picked 2 of the 4 available Colour3 nail polishes, the fimo decorations and the glittery topcoat. Today, I'm going to show you swatches of the nail polishes, because I just couldn't wait to have all together to share with you. The decorations and the topcoat will follow! This is day 23 of the 33 Days Challenge and the prompt for today is Geometric! Hi my dears! How are you today? 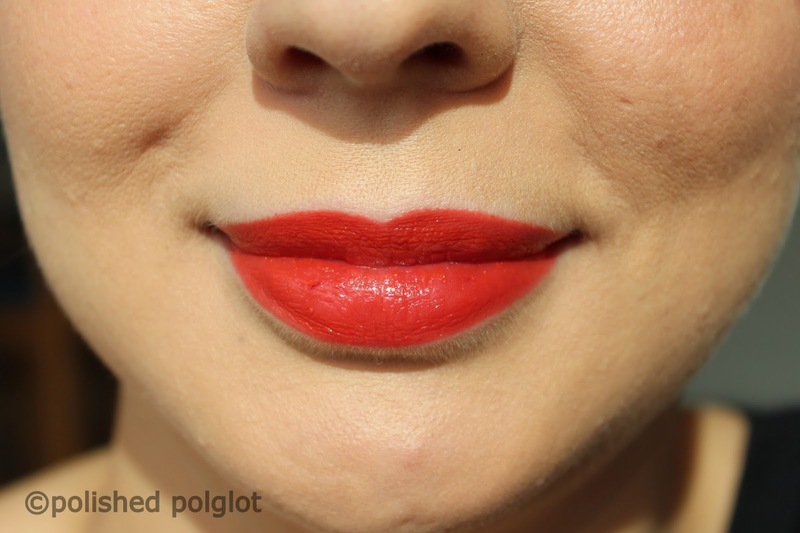 I wanted to share with you a post about two lippies I bought a couple of weeks ago. These are Manhattan Intense Lip & Cheek balm, which are part of the LE Beauty in the air. The collection includes three shades, of which I've only picked two, but I love them so much I might still pick the third one. They'll be available until the end of November wherever they sell Manhattan ranges. 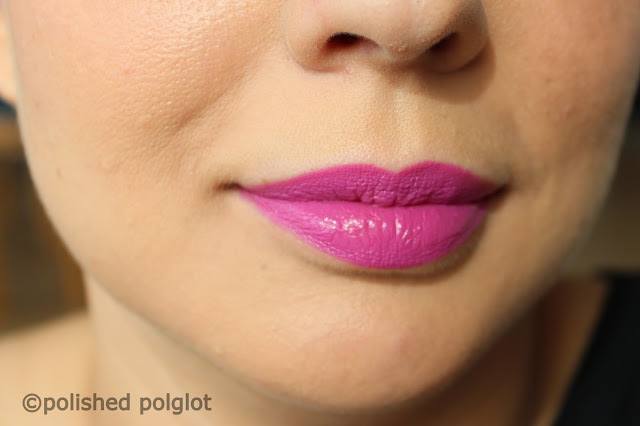 These lippies are quite soft and creamy, they feel comfortable and moisturuzing on the lips. But what is really outstanding is the pigmentation. It caught me by surprise because the word "BALM" usually stands for sheer shades. I chose the shades Tomato juice which is a rich saucy red, and First class which is a vivid orchid pink. The swatches above show each colour applied in different ways n°1 was applied directly with the pen and then trying to blend it. The result was patchy colour hard to blend. N°2 is by applying very little colour dabbing with fingers and it's a much smoother and natural effect. I think these are great 2 in 1, pigmented, moisturizing, pretty colours and they only cost 7.20 CHF each. So I'd say if you're planning to add some multi-purpose items to your stash these are very good options. Have you tried these yet? Have you found any drugstore product that surprised you positively lately? Don't hesitate to leave your opinion in the comments! Hello my dears, how is your weekend so far? Today I have a super quick nail art to share with you that I have done using Lace nail stickers sent to me by Born Pretty Store for my honest review. These Lace stickers come in different motives and you can choose black or white. Mine are black H210. Hello my lovelies! How is your Saturday so far? What I'd like to share with you today is one of my favourites items this Fall, one I did expected to like as soon as I swatched it on my hand the first time I saw it at Manor's Chanel Stylo Yeux Waterproof in Khaki précieux. Anyone else planning to have a good rest and FUN? Today is day 21 for the 33 Days Challenge and the prompt is Europe. I went with a very simple mani representing both my favourite cities in Europe, Rome and Paris. the two first places I visited together with my husband back in 1999 and where we spent the most romantic escapades since we met 16 years ago. Hello lovelies!! I hope you're doing fine today. 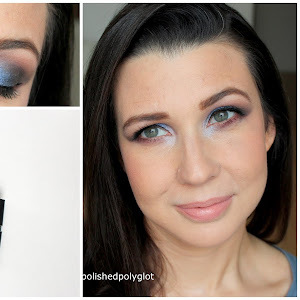 I have a really quick post just to share with you some great drugstore cream eyeshadows. These are Manhattan Endless stay eyeshadow duos, which belong to the Colour collection by Bonnie Strange and are limited edition. I got these early in October, and I should have posted about them earlier, but as I was so busy with the challenges I couldn't find the time. We are already at day 20 of the 33 days Challenge, wow, does time fly or what? Today's nail art is dedicated to a pattern in my wardrobe and I thought to make houndtooth nails, based on a pair of leggings I got for Fall. Hello my lovelies it's me again! Finally I managed to swatch the rest of the Superheroes collection over the past 6 days. As an update on my bad nail brake, which is far from good, at least it hasn't torn off and is not bleeding anymore, so that's good. That's the main reason keeping me from using acetone. Hello my lovelies! All ready and set to start the week? Hello lovelies! How was your weekend so far? Are you enjoying your Sunday evening? Hello my lovelies! Happy Saturday! How is your weekend so far? As October is already gone, I have several empty products to show you. I hope you find it useful!